Home » Baseline: Our Blog » News » Are you a victim of the power outage in Pretoria East? Netshield can help. Are you a victim of the power outage in Pretoria East? Netshield can help. Some suburbs in Pretoria East have been left without power following a fire at the Mooikloof 132 KV substation. Areas affected are Moreleta Park, Pretorius Park, Garsfontein, Boardwalk Meander, Woodhill, The Wilds, Mooikloof, Mooikloof Ridge, Onbekend, Zwavelpoort and Mooikloof Agricultural Holdings. Some radio stations are reporting that the outage can last as long as up to 5 days. Now, that can be quite a disaster to be left in the dark for so long, especially if you have children that need to do homework, you cannot charge cell phones or laptops…..
Netshield’s Long Life UPS is an affordable, compact, easy to deploy device that helps you beat the darkness by giving you longer duration back up than a regular UPS. So when the lights go off you will have thirteen hours of back up depending on the load. It’s the ideal solution for keeping critical processes like lights, cell phones and computers up and running during power outages. The LONG-UPS-2.4KVA uses a DC to Ac power system with an integrated charger/rectifier through a long life 12V deep cycle battery. 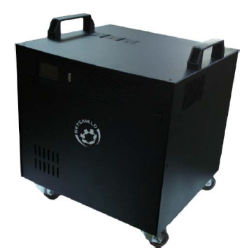 The units serve as a simple to use, simple to install, plug and play standalone backup power source during power failures. Although on the heavy side, it is possible to load in the boot of the car to recharge at the office during the day if needed. It is equipped with wheels that makes pulling it around easy. With the Netshield Long Life UPS there’s no reason why critical processes in your home or business cannot continue when the lights go out.